St. Patrick’s Day is one of the best holidays that you can ride on and attract more business sales. With people who are looking for exciting ways to celebrate this day, you can take advantage of this and grab attention as much as you can. And since this holiday only happens in a single day, do not let this opportunity pass and make extra efforts to boost your marketing strategies. One of the best marketing strategies that can help you make the biggest impact during this holiday is to make use of technology, specifically emails. In this article, we provide you with email examples and templates that can help and inspire you in boosting your marketing efforts during this flash holiday. If you are looking for ways to generate buzz during St. Patrick’s Day, you need to come up with exclusive designs or collection of products just for this holiday. By having limited edition offering during St. Patrick’s Day is a great opportunity for your business to drive sales because not only are these relevant to the holiday, but this also sells the sense of urgency and exclusivity among your target customers. And in order to market these limited edition products, the use of email marketing is your best option since a lot of people are usually on their phones and can easily check up on your email blast as soon as you send it to them. 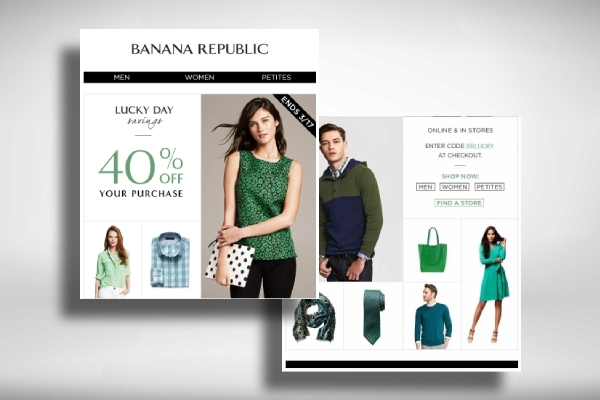 Just like with this Banana Republic email marketing, they showcased their exclusive collection of green-colored fashion items with a theme that is in line with St. Patrick’s Day. Another way to promote your business during St. Patrick’s Day is by offering discounts or running a deal or promotion with your current products that have an appearance, packaging, or labels that are similar to the theme during St. Patrick’s Day. 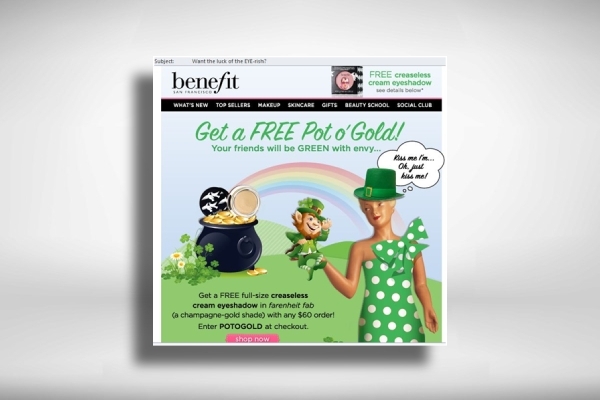 Just like with the Benefit Cosmetics’ email marketing for St. Patrick’s Day, they are able to effectively advertise their promotion, which is by providing a freebie to those customers who would buy $60 worth of their other products. Other businesses would also create more creative unique ways just to entice people to participate in their promotions and one of it includes offering exclusive promotions and discounts to those customers who are wearing green during the holiday. Some organizations would make use of St. Patrick’s Day as an opportunity where they will organize charity events in order to raise funds for a certain cause. 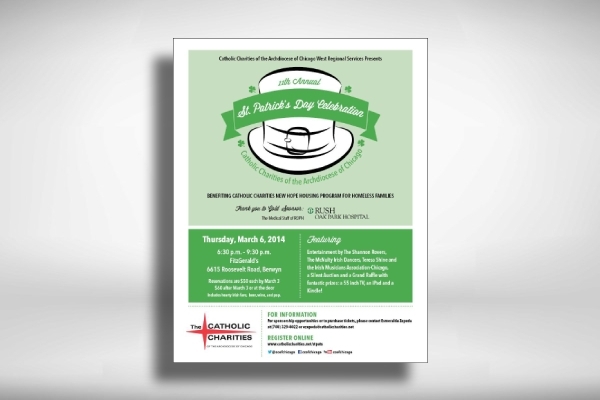 Similar to these email marketing made by a certain religious organization, they advertised their annual St. Patrick’s Day celebration wherein the funds raised will benefit homeless families with housing programs. The celebration wisely makes use of the holiday with activities such as an auction and a grand raffle and, of course, with Irish meals and beer. As mentioned above, coming up with limited designs or collection especially for St. Patrick’s Day is one of the best ways you create buzz for your business. New Balance, a famous shoe brand, has come up with a limited edition shoe design just for the holiday. If you are this dedicated to celebrating St. Patrick’s Day while still being able to drive sales for your business, you can go as far as their efforts. Make sure you incorporate such exclusive products with the use of symbols that are indeed related to the celebration of St. Patrick’s Day. And as soon as you finally come up with one, immediately include email marketing as part of your marketing efforts to spread the word about your limited edition product. 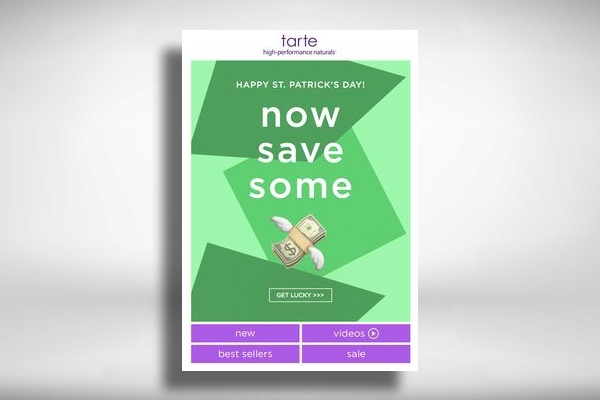 By piquing the interest of your target customers through a cryptic but interesting catchphrase like this Tarte Cosmetics email marketing, you will surely drive traffic not only to the particular site where you are directing your customers to but you will also be able to generate sales since you have provided them with a discount. By doing this, you are also incorporating one of St. Patrick’s Day symbols which is a pot of gold. How? Upon clicking the link, your customers would feel like discovering a pot of gold upon realizing that they have been directed to a link that enables them to get a discount. 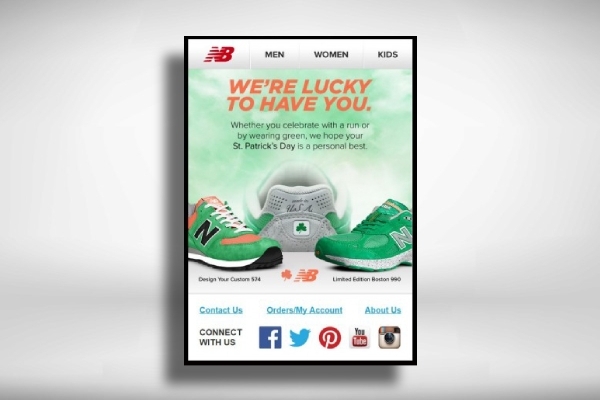 We hope that you will be able to boost your St. Patrick’s Day promotions and sales with the help of the email marketing examples we have provided above. Do not worry if this is still your first time creating such kind of marketing effort, take it slow and just get as much inspiration as you can from the given examples above and finally come up with a killer email marketing design on your own.